Captive and chained Aboriginals, early 1900s. This picture is taken in the early 1900s at the Wyndham prison. Wyndam is the oldest and northernmost town in the Kimberley region of Western Australia. It was established in 1886 as a result of a gold rush at Halls Creek. However the circumstances and the story behind this picture remain unknown. The Aboriginals could have been arrested under the various local laws passed that forbid them from entering or being within a certain distance of named towns. They could also have been arrested for drinking or owning firearms which was illegal for them at various times. It’s also possible that they have been rounded up to be moved to a reserve areas which were being created at the time and that these individuals did not want to move. It could even be a staged picture for tourists/publicity reasons. In the 19th century Australia each prisoner carried an iron chain around his neck (weighing approximately 5 pounds – 2.3 kg) in the open where temperatures usually ranged between 35 and 45 degrees Celsius. It was secured by a padlock and individual prisoners were then chained to another man. Chains of prisoners had as many as nine or ten men attached to each other. Later a new method of chaining Aboriginal prisoners was decided upon. They were to be chained from the ankles, the chain was to pass inside the leg of the prisoners trousers and supported by a heavy belt around the waist. Prisoners could then be chained in pairs and “allowed” to work outside the prison walls. There were iron rings bolted to the walls of some jail cells where prisoners were believed to be chained for chained for prison discipline. While the Indigenous people of Australia were subject to forced labor and experienced slavery like conditions, there was no slave trading. By the time that the British effectively subdued the indigenous Australian population slave trading was already illegal in the British Empire. Moreover there was no need. While there was a manpower shortage in the early colonial settlements, the colonial government responded by making convict labor available to private individuals. The Aborigines are, even today, second class citizens in their own land. What a bloody shame! Just over 600000 Aborigines left in Australia, what happened to the whole population??? There is so many hidden secrets in this world, evil ones, only God knows. 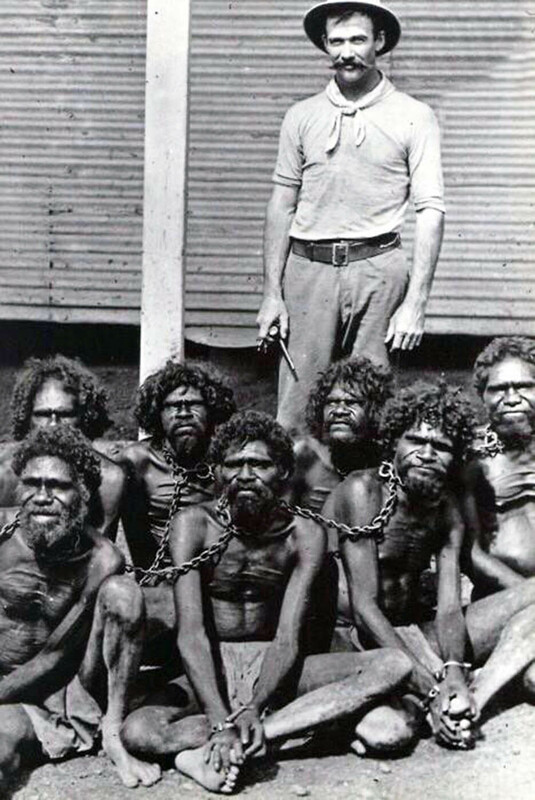 I've seen even worse than this of Western Australian Aborigines chained in the 1920's. Terrible history. To think we still had slavery in Queensland into the 20th Century, i.e. the indentured islanders who were forcibly gang pressed into serving on the Queensland sugar cane plantations for up to ten years. Our historians say it wasn't technically slavery, as they were 'paid a wage' and it was given to them on their release. However, deductions were made to cover the cost of housing and feeding them. At least the Americans were honest about their slavery and not weasily wise. I studied this at Uni and the facts are; there were approx 70,000 brought in. They were on a standard 2 year indenture and paid the equivalent of the lowest wage that white men were paid. There are no records, for example, a ship's log, saying that they were forcibly taken, while it may have happened, it is purely conjecture. There are however 100s of letters in the Australian archives written by Kanaks begging to be allowed to stay after the importation practice was ended in 1908 which does not support the idea that they were here against their will. compare this to about 250,000 Irish and Scottish "free" settlers, who were indentured labourers through the early 1900s. They were on a standard 7 year indenture and unpaid. I think we need to consider the context here. These are prisoners in a prison being pressed into working as a "chain-gang". This still happens in many parts of the world, most notably the US where prisoners of all colours, races and religious backgrounds are chained together while working outside the prison grounds. There are many photos of black prison guards controlling groups of white men in chain-gangs but I have never seen or heard any outcry about those photos. Terrible history, BUT DON'T BELIEVE people that tell you that aboriginals are treated as second class citizens today. Quite the contrary. The Australian government goes out of their way to help the Aboriginal people today. It is the Aboriginal people that won't rise up & better themselves. Don't know whether they have a sense of entitlement or whether the past still has a bad effect on them today (e.g. inter generational alcoholic families). Maybe, to put it in context, it might be like the American Indians, (First Nations) circumstance. Harry, it is easy to think this from an outside perspective, however, it is far from the truth. Whilst the government may TRY to help, they go about it in ways which are not actually beneficial to Indigenous Australians. They look for Westernized solutions and this is simply not what Aboriginal peoples need or want. The genocidal acts which were afflicted upon the Aboriginal peoples were atrocious and have left scars which travel from generation to generation. Not only was their land stolen, their children were stolen, their culture and languages were basically forbidden, they lost every inch of identity that they once had. Nowadays, Indigenous communities are suffering the severe consequences of a history of abuse and dispossession. We took away their connectedness to their land, took away their children, and abused them for generations. We took away their hunter gatherer lifestyle and introduced an abundance of processed EVERYTHING into their diet, and we also made it a criminal offense for them to hunt in their own land. We introduced health problems, diseases, we took away their housing, we labelled them trespassers on their own sacred land and then threw them in jail. The Australian government makes programs and policies to "help" but they are created by people who live by Western values. The Aboriginal peoples do not even get to practice their right of self determination. I am in no way having a go at you, Harry. I just suggest you do some research into these issues. It's easy to see that the Government is putting together campaigns such as Close the Gap, and therefore think they are doing a great job in helping. However, these programs have a huge fail rate and are nowhere near on track. I am doing Indigenous studies in university and what I have learnt about our countries past saddened my immensely, and also opened up my eyes on the need for drastic change. Harry you can see the picture. You think people can be treated like that and then a couple of generations act like nothing happened? You're right about terrible history and it continues. Its so sad to be looking at pictures like these, black people the first people on earth are the most suffering nation in the world. God only knows what is happening. Same thing happened in Afghanistan by Pashtuns against the indigenous people (Tajiks, Hazara and Uzbeks) in 18, 19 and 20th centuries.